When the first of the new Empire flying boats began to come on line at the end of 1936, they were initially employed by Imperial Airways on the Mediterranean between Brindisi, Italy, and Alexandria, Egypt. Early the following year, Empire 'boat services were progressively extended over the whole of the most heavily trafficked section of the Empire Air Route between Southampton, England, and Alexandria. 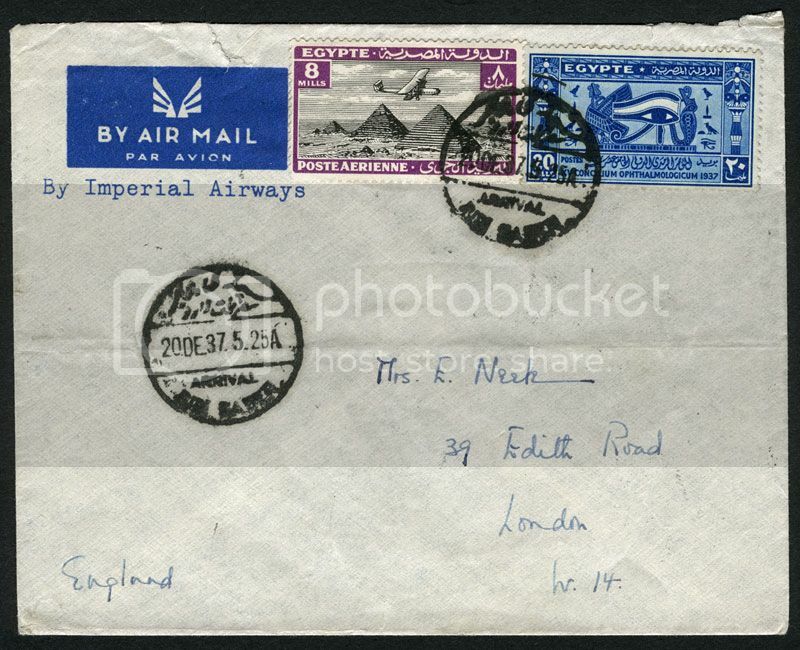 This letter was flown Alexandria-Southampton in December 1937 aboard G-ADUY Capella, operating service IW609 ('India Westbound'). It would be another six months yet before the Empire ‘boat services extended to Australia. In the meantime, the eastern sections of these services continued to be operated by a variety of aircraft including the biplane Handley Page HP.42s of IAL and the D.H.86s of QEA.